P.S. Do you love how my boots made it into one of the pics? I thought I’d throw that in there for all of my blogging friends who do whatever it takes to get the shot. Even if that means standing on your marble console table that is meant for coffee table books and foo dog lamps not cookies and duck boots. 1 box of Trader Joe's "Candy Cane Joe Joe's"
Combine flour, baking soda and salt, lightly mixing. Set aside. Beat softened butter, brown sugar, and sugar until fully combined and creamy. While beating on low add vanilla, peppermint, and eggs. Gradually beat in flour mixture. Once combined add chocolate chips. Take 1 Trade Joe's Jo Jo and with an ice cream scoop scoop out 2 scoops of cookie dough 6. and make a sandwich with the Jo Jo in the middle. Press lightly and work the cookie dough all around the Jo Jo so it encases the cookie completely. Smooth out the dough in your hands so the entire cookie forms the shape of a hockey puck, but slightly smaller. Place on cookie sheet and repeat. Let cool for 15 minutes on a cookie rack and enjoy. 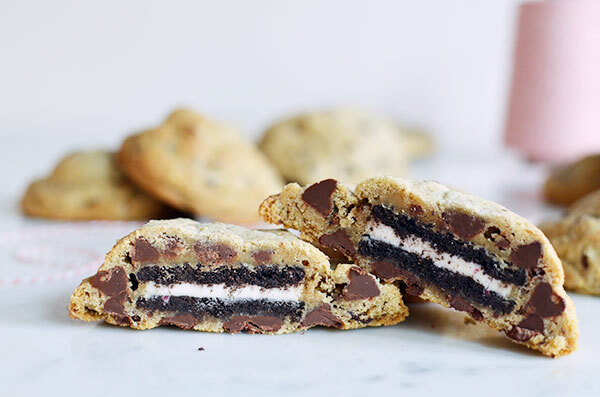 When I first saw these on instagram, I totally thought they were OREO stuffed chocolate chip cookies. Looks delicious none the less! I’m so happy with the progress of my gallery wall, and think I want to order the banana leaf watercolor print today! Ummmmm you MUST try them!! OMG! This looks amazing! Two of my favorites cookies come together! Yes!